Has Mick Jagger just teased a new Rolling Stones song? Mick Jagger uploads a short video of him playing and singing a new track – says 2019 is "all about writing, recording"
Further news has been thin on the ground since then, partly due to the Stones hitting the road on their No Filter tour – but frontman Mick Jagger could have just teased a new track from the record. While the Stones launched their covers collection Blue & Lonesome in 2016, fans have been waiting for their first record of original material since A Bigger Bang in 2005. 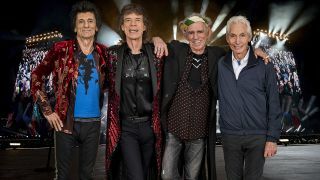 The Rolling Stones will head out on tour once again this spring for shows across the US, kicking off at the Hard Rock Stadium in Florida on April 20.